I’ve been putting this off for a while now…. I’ve been putting off writing this blog entry for a while now. Not that there’s anything in it I’ve not posted elsewhere before, but it is one that I feel it’s time to push into the mainstream. The reason why I hesitate (and even cringe) is because the subject matter is so unusual that it will cause a conflict with people’s perceived reality and believe systems. Trust me when I say that it certainly did with mine. So deep breath and here we go. What if you were told that you were a mythical being? What if you had the same message in your thoughts for most of your life? Moment after moment? Hour after hour? Day after day? Year after year? Decade after decade? No matter what you do, no matter what you try and no matter how much you protest, that message never stops… ever! And over those decades, amazing things happen and people come in and out of your life to validate that what you are hearing is not just in your mind, but a very real thing. Well, this is my life in a nutshell. This has been going on since 1988. I’ve spoken a lot about various incidences in my life: Those strange stories that defy rational explanation. I’ve discussed my guides and done plenty of channellings when I’m stuck for ideas or answers to topics I want to write about. And in a way, I’m comfortable putting those out there, because to me, they make sense and others seem to get something from it. I’ve also discussed how my guides keep on telling me messages over and over until I get what they mean and I do get a lot of repeating messages which come and g over the years. But there is one that doesn’t stop no matter what. The message is: You are The Phoenix. It doesn’t end there either. My guides keep on referring to me as Phoenix. On the rare occasion they’ll call me by my name, but generally, it’s Phoenix. There was a period of time where events lead me to completely shunned anything phoenix, but it didn’t help. In fact, everything became stronger, and no matter what I did, I would see the word Phoenix in almost everything I did or would hear it mentioned somewhere. What was more, people around me, once they started associated with me, said they saw the same thing, too. You could argue that’s confirmation bias, but that doesn’t account for everything that happened, especially the two years where I was extremely anti-phoenix. Most people have heard of what a phoenix is nowadays, but for those who do not know, a phoenix is a mythical bird that was said to live for many years, and then build a pyre and consume itself flames, only to rise again more powerful and beautiful than before. It was primarily associated with Ancient Egypt, though it was been noted in many other cultures under different names. The death and rebirth part appears to be the more endearing part of this myth: The rising from the ashes, in spite of all the odds. 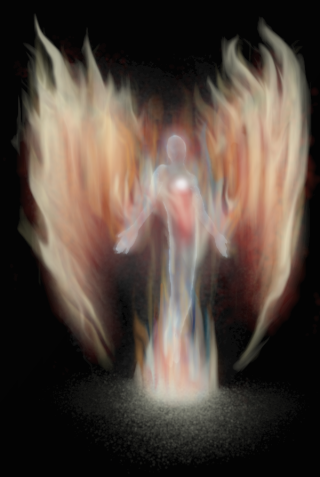 And for a while, I wondered if that is what my guides were trying to tell me: That I had risen from the ashes. But no, that wasn’t it at all. In fact, they were being quite literal. Now, last time I looked, I looked like a human. Not a bird. (Though, as I recently blogged, I never really felt all that human.) However, my guides assure me that what they are talking about is a representation of energy. When I finally started to look into what was going on, a story began to unravel that surpassed anything my imagination could conjure up and over the course of the years, what I ended up with was an amazing, yet cohesive sequence of events that made the statement ‘You are the Phoenix’ look like common sense because it only got stranger from there. Around 2011, I tried to write a brief summary of what happened and the people involved. It just didn’t work on the levels I was looking for. So I decided it was time to write a cohesive history of what happened and everything that led up to it happening. It’s taken me around 2 years to finish it. It was made especially hard because new information was (and still is) coming in all the time, putting new perspectives on things. The book is called I Am The Phoenix. My intention is to provide a reasonable sample of this book on this blog, so people can get a taste for it, and decide if they want to hear the rest of the story, which, even if I do say so myself, is incredible. Past lives – Remembering them or more dramas than a soapie. There are various methods of remembering such things, including meditation and past life regression. I believe that when you go about it in that manner, you not only risk awakening traumatic memories, but you may not remember them correctly. This may occur because what you remember may not be the full story, or even the entire memory of those events. When things are remembered out of context, everything takes on a completely different meaning. As mentioned, you can also awakened past resentments and dramas, though this may occur regardless. If you’ve ever met someone you’ve instantly disliked, it may be due to some past life conflict. The same goes for those you feel an instant connection to. They may have been family, friend or lovers in a past life. There is also a school of thought that suggests that because you knew someone in a past life; it means you must connect them with them in this one. This is akin to saying that you knew Mr. Blogs from accounting in another part of your work place, so you should connect with him outside of the office. Realistically, that’s not how it works, of course. There is a reason why we don’t remember our past lives before we are ready. We are meant to live this life, unhampered by the baggage of the past. Each life is a fresh, new start, and we are meant to forget everything we ever knew. Free will dictates that we can choose to remember if we wish, though generally, in our greater wisdom when we are spirit deciding on what life we will be born to, we know it’s not a wise choice. Watching my own soul family squabble over past grievances feels like watching your kids having an argument. I end up just shaking my head most of the time, knowing there isn’t anything I can do, as the past is the past, and it’s who and what we are being now that really matters. When you are ready, those past life memories will return, normally spontaneously. Sometimes someone will help you to remember, or jog the memory, though beware… it is extremely easy to be subject to suggestions and remember something that did not actually occur. As always, go on your feelings. If they don’t feel right, then something isn’t right. This goes for when they do feel right. Paranormal series: Songs I’ve never heard before or name that tune! Have you ever heard a piece of music, knew it by heart, and yet it was the first time you ever heard it? I know I have, but it always happened in dreams, or the period where I was between sleeping and waking. The problem is, though, unless I somehow record it right away, it fades from my memory like gossamer strands on the breeze. My earliest memory of such an occurrence was when I was around maybe 14 or so. I was just falling asleep, and I had this vision of both my parents standing on either side of me while I was playing the piano. The tune was one I knew well, and yet I had never heard before… or since. I woke up, and the memory, sadly, faded. It is true that I used to play a piano when I was nine years old. Well, play isn’t the right word. I did it for a year, and I did not enjoy it, and it certainly wasn’t the high standard of the music I was playing in my vision. Also around those years, I would hear music playing as I would drift off to sleep. Mostly it was instrumental, though not all the time. It was never music I knew, but I enjoyed hearing it. It also was not from some other place outside my room. I could only hear it in my mind. I would call it the music dimension, and I would often try to tune into it as I was falling asleep. I would succeed only some of the time, though. That, too, eventually stopped. I think I just forgot to try and listen for it. Another music dream occurred in 1983. It was one of those confused dreams, but someone said the following words to me: Brilliant days. And I replied: Wake up on brilliant days. The weird thing was that I retained that memory. Maybe I had heard before that dream, as the album did come out in 82, even though I didn’t actually own it till later. It was just weird to have that line in my dream. Another incident was when I went to sleep recording a classical piece of music to tape back in 83. I needed to get up around 3 am to drive to a holiday house, and I got some sleep in the area where I kept my music equipment. Once recorded, the tape would reach its end, and automatically rewind. When it was time for me to wake up, a very loud burst of music woke me up. I assumed that the recording had just ended, but when I checked, the tape had fully rewound so there was no way that could have occurred. Another incident was a dream I had just before waking up. It was a very catchy disco song that I knew well in the dream, but when I awoke, I knew I had never heard it before. Sadly, that song faded right away. I did not have anything more of that nature occur until more recently. There were two separate dreams where I was dreaming of songs. They were also catchy, and I somehow knew them. I remember both songs, and while they do not actually exist in this world that I’m aware of, they are very well formed and could actually even have hit potential. . I also spoke of, in a previous blog, about hearing a song all night when I was nine years old, but the different was that I was not asleep for that incident, so I’m not sure it falls into the same category. That is all I can recall in regards to such incidences. The only other thing I’ve had on the odd occasion was waking up to woman calling my name, even though I was alone in the house. I think, each time, this occurred, there was a need for me to be up and awake. I’ve heard of the Music of the Spheres, and while I am a little vague on what it actually is, I wonder if that is where music comes from, and what I was able to hear. Has anyone else had such experiences? Paranormal experiences series: Trapped in a world you did not create… or did you? When it comes to time-lines, the reason you shift is because the current one you are on no longer serves your current purpose. This may be because the energy is not quite right, or certain events need to happen that won’t occur in the one you’re currently in. You may well find yourself in a reality where people seemingly have a change or heart, a more positive attitude or some innovation has been made which makes things possible. But be aware, these things can work both ways. Your actions and intention will attune you to which reality you will end up in. Negative intentions may shift you to a darker version of your time-line. If you constantly do things that are positive and uplifting, then this allows you to shift to a more positive version. For those who can see possible futures, they will know there are some incredibly dark versions of this world out there and the shifts to them may happen gradually. The shifts happen naturally but never without your permission on some level, even if it’s on a level that you are not aware of. They may occur in many ways, too. Perhaps you might die a natural death, and then shift to a time-line and to a point in time before you got sick. Perhaps you might be in a car accident. You might have thought you survived against all odds, but it’s also possible that you died, and then shifted to another time-line and to your mind, seemingly walked away without a scratch. Perhaps someone killed you and to horror of those around you, you died, but to your recollection, it never happened because you shifted, and came back to a point just before it happened. You might also come back with a premonition of danger and avoid doing something you feel will not end well. It’s also possible that in this version, others were the ones who ‘died’ and you survived. Or it could be just through the natural cycle of reincarnation. Remember, all the realities exist, and they are all being lived in the eternal now. Where you are is where your focus is at. That is the Master You. The one where all your attention is and the current life that you, as a soul aspect, are living. This may mean that those things that seem like terrible events in your life may well be a blessing. They may well free you to move to your next level. And this is why it’s so important to focus on things that you do indeed desire, and more importantly, what will not hurt or disadvantage others. Every time you abuse someone, steal, scam, put them down, take advantage, etc, etc, you are actually attuning yourself to another level. They add to your vibrations and your energy pool. Eventually, you will find yourself in the reality you have attuned to, and wonder why things are so bad. I’ve rambled on a lot here so I will try and summarize this post. Everything you do attunes you to the reality you are currently experiencing. You will shift when you hit a critical mass. The shift may be up, down or even sideways. Whatever you do, do it from a place of love instead of fear. Paranormal experiences series: Time is an illusion or but yeah, you’re still late for that meeting. Warning: Extreme metaphysical / spiritual information in this entry. Avoid if not your cup of tea. Last entry, we discussed how World of Warcraft can be used as a model for time-lines. In this entry, I plan to go into this further. Free will allows us to experience whatever we choose. When we decide on a direction, all is set up on those higher astral levels where our main soul aspect are. On an even higher level, which is extremely high compared to our current one, the souls we are connected to, which you can consider your greater self, has all the knowledge and insight that will ever been needed in order for us to create and experience whatever we choose. Sounds fantastical? Too many flaws in this premise? I can’t blame you for thinking that. Unless you have experienced something along those lines, it’s often very hard to accept it as possible or even fact. To clarify I am basing my premise on the following assumptions. Time is an illusion. All things are happening right now. Which means all realities exist at the same time. The fact there is no time means everything must be happening right now. Only the illusion of time exists. Nothing is random. Unless you choose it to be. You can experience randomness if you wish, but even that is a choice. For instance, you might say, there is no free will, and then experience that very reality because you have chosen it. Even not making a choice is making a choice. We have all of eternity to experience everything we wish in any way we want to. Hence, we can keep on coming back again and again, until we are done, and ready to move on to something different and new. Now, all the above are certainly not my ideas. Such things have been spoken of many, many times. I am just using them in this context of time lines. But there is something I have felt, that I haven’t come across elsewhere before. There is a ‘Master You’. By that I mean, while we experience all realities at the same time, there is one main You where the current focus is. You can see potential time lines, the probabilities, and experiences what could have happened, but didn’t, simply because you didn’t choose them. It’s as though, you have sent out your Avatars to experience those probabilities conceptually as though you were doing a simulation. For all intents and purposes, it has happened, but not to the Master You. But all those Avatars, that have experienced those potential time-lines, return to You, and give you other experiences and insights that you might not have otherwise been able to obtain normally. You can follow those time lines in your mind, and see what might have been. For example, I’ve personally followed three potential paths that I could have had at various points in my life. I saw them unfold in my mind’s eye, and eventually saw how they ended. Some time-lines you may not want to experience at all and you do not have to. It’s all to do with what we choose in the end. Still, while this addresses one aspect of this subject, it doesn’t explain why we sometimes shift from one line to another. I will attempt to address this next. Next: What is attunement and how does it affect us? Paranormal experiences series: You are an Avatar or is World of Warcraft a model for time-lines? Most people nowadays have heard of World of Warcraft or (WoW), the massive multi player online role playing game (MMORPG). The concept of time lines, dying and returning is a hard one to fathom. Word of Warcraft can help to illustrate some of the basic points. To explain, for the uninitiated, it’s a role playing game where you choose your side, your character and then level it so you can enjoy many aspects of the content available. Now, in game, each server is exactly the same to play on, but each version of the server has its own set of people, interactions and even rules. Some are for role playing. Some are for player v player and some are for player v environment. Regardless of what you choose, the same in game events happen. You can choose to indulge yourself in any of the many activities available, from pet battles to raiding. And each time you try something, it might in a different way, especially when you’re trying to work out how to defeat an objective. You could liken this to the time-lines I’ve been talking about. Each version is identical, but each time, events play out different (even if it’s just slightly), depending on what you choose to do, who you decide to do it with, and so on. You can also decide you’re not happy on the server you are on, and decide to transfer. Everything will seem the same, but it won’t be. There will be subtle differences, including the feel and atmosphere of that server. This is akin to shirting to another time-line, where the current only no longer suits your purpose. Also, death has no real consequence. Worst is that it will cost you some gold for repairs, and delay you for a few minutes. Should your character die, you just come back, over and over again, until you work out a way to win or avoid death. Though I’m using Word of Warcraft as an analogy here, it’s not a perfect one, but it helps to paint the picture. In real life, you come back time and time again, trying different ways, making different decisions, and trying to work out how to experience or achieve the goals you have set for yourself. But you may not be aware that this is happening. Or if you are, you will more than likely put it down to a faulty memory due to the fact that it doesn’t make any logical sense. You could liken that to what you refer to as your higher self being aware of what you need to do in order to achieve the goals you have chosen in this life. You may not be aware of it, but your greater self knows everything it needs to know in order to do the things you desire. But let’s not get too complicated here. Let’s look at how you are an Avatar, and how it all works. Next: How you are an Avatar.